Whether you’re looking for the best muffler to deaden some of the sound coming from your car or an exhaust tip that will amp it up, I’ve got you covered. 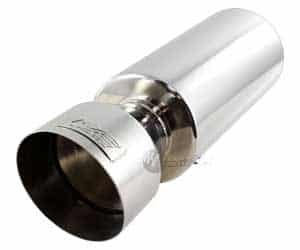 I’ve got the best muffler that have the ability to make your car almost whisper quiet, as well as performance exhaust tips created to give it a bassy, throaty purr or even a loud cackle – and, of course, those of both kinds which improve the overall look of your vehicle. It’s be a long and grueling journey, but I’ve managed to crawl from corner to corner of the internet, tracking down the consumer favorites among mufflers and exhaust tips so we could collect them all here in one place for you. So, without further delay, let me present you with my best muffler and exhaust tips. Arguably the most heavy-duty, durable muffler/exhaust-tip combination on this list, the Magna Flow is built to stand up to real life on the road. Though it is beautiful enough to adorn even the most custom of rides it’s not the type of system you need to protect by taking it slow over speed bumps. Since we’re somewhat on the topic already, let’s discuss aesthetics. Though it’s mostly muffler there is a slight exhaust tip on the end.It’s just enough to give your car that finished look without protruding past a blunted bumper. If you need something a little longer, though, to clear a bumper that sticks out a little further you may want to look elsewhere since this one is bound to leave sooty reside on a thick bumper. You don’t need to go with some cheap chrome knock-off to get the shining appearance popular among many car enthusiasts. The polished stainless-steel construction isn’t just durable, it’s also flashy. The straight cut end of the tip will appeal to those looking for something with a basic feel, while the rolled edges of the tip offer it a more finished appearance. Let’s talk sound. The muffler portion of this system will cut some of the noise coming from your vehicle’s engine. There are no chambers, S-bends, or piping of any kind inside the muffler to slow the flow of air as it makes its way through. When damped the sound is only insulating material. This means that while some of the higher-pitched sounds will be cut out the overall volume of the exhaust system won’t really be deadened much by this muffler. Mufflers which restrict the flow of air actually slow down the entire system which can hurt your car’s horsepower and torque. Though these differences are negligible for most people, performance experts will be happy to know that the open flow of the muffler’s chamber and the large outlet on the tip shouldn’t really have an effect, at all, on the engine’s ability to do its job. 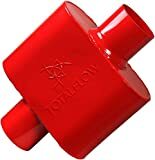 Since the tip itself is rather short and has a sufficiently large 4-inch outlet it will create a deep, throaty rumble. Combine this with the muffling power of the muffler itself and you can be sure that this system will create a profound, bassy growl. Great if you want to slightly alter the sound of your car’s exhaust by dampening the high-frequency sounds and adding a bit more of a bassy growl without adding too much to the overall appearance of the back end of your vehicle. This performance exhaust tip does a lot more than simply making your car look cooler (though that certainly is an added benefit). It changes the sound of your exhaust system in a way that doesn’t make you look like you’re trying too hard. Of course, the faster you go, the louder it gets. But, this tip isn’t made so much for loudness – it focuses mostly on fierceness. It’s wide 3.25-inch outlet gives it a nice throaty growl whether idling or running at mid to high RPM. Made from stainless steel, through and through, it bumps itself ahead of all those cheap exhaust tips made of aluminum and other less-durable types of steel. Don’t be fooled by their shiny finishes, a lot of those competitors have coated cheap metal with a nice stainless steel or chrome finish. Not this one, though. This one is fully stainless steel with a beautiful polished finish. It is rust and weather resistant – made to stand the test of time. The angle cut of the tip keeps a nice smooth line on the back end of your car, tucking nicely into many sporty bumper designs. It also helps protect the back end of your car from the heat of the exhaust by angling it slightly downward without losing any of the sound of your exhaust the way that downward-facing tips do. DC Sports claims that this tip will increase your horsepower and torque by reducing back pressure. The jury is still out on that one. For the most part, exhaust tip effects on horsepower and torque seem to be negligible, but hey, when you really need it even the tiniest difference can matter. Though it doesn’t quite have the abilities that DC Sports claims it does (it won’t greatly affect your horsepower and torque) this exhaust tip add style and sound to your car while also deflecting hot exhaust away from your bumper without sticking out so far that it becomes unsightly. Looking for a dual wall exhaust tip with an attached straight exit muffler? Look no further. This Spec-D will enhance the look, performance, and sound of your vehicle. How? Let’s dive into the details. The dual wall exhaust tip not only looks mean it also helps air (and heat) escape the car quicker. This keeps your engine cooler and allows it to work better, increasing torque and horsepower. Of course, none of that would matter if the muffler held up the flow. Lucky for you, this one will not. The straight exit muffler is designed to dampen sound with insulating materials but without slowing the flow of air. 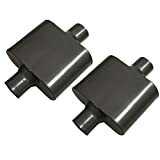 Some other muffler styles (like those with S-bends and multiple chambers) restrict airflow in an effort to reduce noise. Although these models reduce noise a lot more than this one will, they will slow your car down. Here’s something important for you to consider if performance is a main objective for you. A simple single wall exhaust tip coupled with an open-flow muffler will maintain the horsepower and torque of your engine. Any sort of closed-off muffler system will decrease those measures. But, when you have a system like this one – with a dual tip and an open muffler – you can actually increase horsepower and torque. In fact, Spec-D claims that this duo will increase your car’s horsepower by 5 or 10. But it’s not all about performance, right? Looks and sound matter, as well. The dual tips point upward which gives it a bit of a flair and, in my opinion, gives a vehicle the appearance that it must be able to move very quickly to have, with the sheer force of air, pushed the tips into such an angle. Now, in reality we all know that the tips themselves were designed this way, but that little part of us that secretly loves comic books and comic book movies likes to be imaginative – it is this part of us that some of these exhaust companies appeal to with their designs. Although the tips point upward, away from the ground, and have an angled cut they are, essentially, straight cut since the angle of the cut to the angle of the ground is about 90 degrees. Sound confusing? It may be. What’s important for you to know is that in terms of sound, this tip will resemble a straight cut more so than one which actually points upward. The two three-inch outlets on the exhaust tip will help create a mid-to-low bassy sound by allowing a lot of air to vacate the system at once. The sound would be much higher-pitched if there were only one outlet, but since there are two you get that bassy sound many car customizers are looking for. 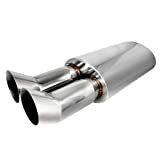 Not very durable but capable of creating a nice sound, a great visual appeal, and increasing the HP of your vehicle, this is great for people who need a performance tip and muffler system but don’t have the money to pay for one that is top shelf. Greatly Enhance The Appearance Of Your Vehicle! This straight chamber muffler is barely a muffler at all since it won’t really trap air. It will hardly reduce the volume of the noise coming from your engine. Instead, it will just alter it by reducing some of the high-pitched sounds it creates. If volume if your friend, this is a perfect choice. You can still get that loud sound that turns heads as you drive by without having a raw engine sound emitted from your car. The straight cut tip attached to the muffler doesn’t impede the flow of air at all, either. At an incredible 4 inches in diameter, the tip will allow air to flow quickly and freely – completely unimpeded. What does this mean? This means that, unlike smaller tips, or systems with chambered mufflers, or even downward-facing tips, this one will not reduce the HP of your car. That being said, it also won’t increase the HP of your car the way that wide open options like the dual-tip Spec-D. The tip’s large diameter and overall short stature help create a low, bassy sound. It gives you more of a rumble than a cackle. If a cackling sound is more your style you may wanna’ take a look at something with a longer, skinnier tip. 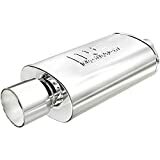 Made of thin T-304 stainless steel, this muffler and tip aren’t as durable as some of the thicker stainless steel systems out there (like the Magna Flow) but they are still significantly more durable than any of their aluminum competitors. This combination is rust-resistant and shouldn’t dent very easily. What’s really cool about this system is that the muffle contains a removable silencer. So, if you want to cut the volume more than you would with a typical straight muffler system you can leave the silencer in. If, however, you want extra volume you can take it out. Great for people who want something made of stainless steel but don’t want to pay an arm and leg to get it and who are looking for an exhaust that won’t reduce HP while also providing a nice deep growl. 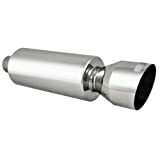 Includes removable silencer OUTLET TIP 4", INLET TIP 2.5"
Just looking for a muffler? Got your own exhaust tip or want to get one that doesn’t come with an attached muffler? Great, we’ve got just the muffler for you! That is, as long as you’re also looking for one that significantly cuts the noise coming from your engine. Some people love that deep growl or high-pitched cackle that can be obtained from an open muffler system with an appropriate exhaust tip attached. Others, though, like a car that’s so quiet it seems to nearly be floating on air. For those folks, the exhaust tip is more about visual appeal than performance or sound. 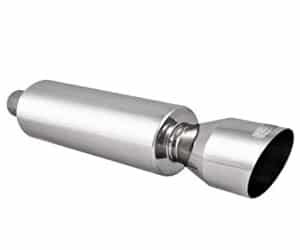 Those folks also need a high-quality, noise-cutting muffler like this one. Let’s start by discussing how well it cuts out noise. Inside this muffler, beyond the sight of your eye, are two chambers. But forcing air to travel through these chambers the muffler sort of slows the air down, helping to reduce its sound. Some people argue that this kind of muffler can reduce your car’s horsepower. If that is the case the difference is hardly noticeable for most people (maybe 5 to 10 horsepower). 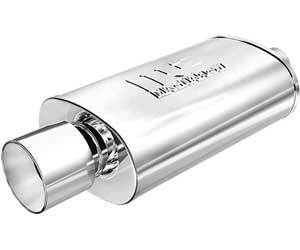 If you want to race your car, though, reducing sound with a muffler like this one may not be worth the trouble. 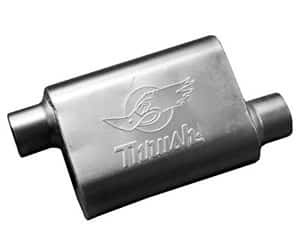 Made of 304 stainless steel this is a very durable muffler. You won’t have to worry about it rusting out over time or denting easily. If you’re looking for quality and longevity you need not look any further. 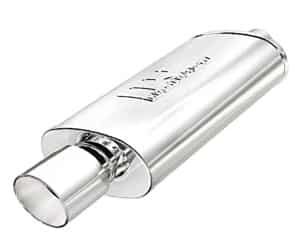 A high-quality, durable muffler for people who want to reduce noise, don’t mind losing a few HP to do it, and who want add their own custom exhaust tip later. What’s The Difference Between an Exhaust Tip and a Muffler? Mufflers and Exhaust Tips are Two Very Different Pieces of Your Car’s Exhaust System. Here’s a question that’s been a bone of contention for many of us. The basic understanding of a muffler is that it is the same as an exhaust tip, but that is simply not the case. A muffler muffles sound (you probably guess that from its name) – but an exhaust tip does not. In fact, many exhaust tips actually amplify the sound coming from your car. I want to start with the basics, though. An entire exhaust system is what runs from your engine to your tailpipe. It siphons gasses from your engine out to the back of the car where they are then dispersed into the air. This is done because the gasses would pool in the area around your engine, seeping into the cab of your car, creating a dangerous breathing situation. It’s also done to keep temperatures down in the engine so that your car can run smoothly without overheating. Alright, now that we have that out of the way let me discuss the differences between a muffler and an exhaust tip. You are probably most familiar with the word “muffler” but you are also probably most familiar with see an exhaust tip (this is probably where much of the confusion has come in). If your exhaust system is equipped with a muffler (most are) it is likely situated beneath your car, in the middle of the exhaust system, where you really can’t see it. It is NOT that piece of pipe at the back end of your car. A muffler is actually round or square, often shaped like a box. Its job is to reduce the amount of sound coming from the car’s engine, especially since that sound is amplified by the piping of the exhaust system. 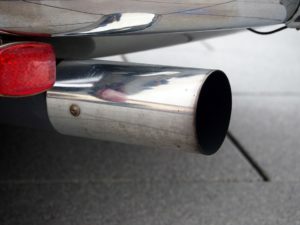 If your car’s muffler has been removed you may notice that it runs rather loud. Some people purposely remove their mufflers to give their cars a meaner sound. The truth is, though, that a basic exhaust system with a missing muffler often sounds just like you’d expect – as though a piece is missing. This is why a lot of people add an exhaust tip. Exhaust tips can alter the sound of the engine as it comes through the exhaust system. It can make that noise louder, lower or higher pitched. It can make it sound like a rumble, a growl, or a cackle. To just change the overall tone of the sound without actually amplifying it, a lot of people add an exhaust tip to a system that already has a muffler. Some people choose volume above all else, removing the muffler and opting for a loud exhaust tip. 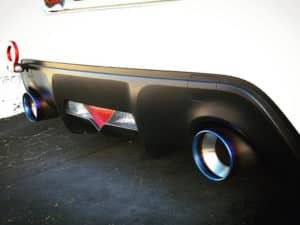 Furthermore, since an exhaust tip is fully visible (it attaches to the end of your tailpipe) many people use them to alter the look and feel of their vehicles. Some people add an exhaust tip solely for the aesthetic effects and not for sound, at all. Large, beefy exhaust tips make a car look musclier. Dual wall tips make it look meaner. Angled tips make it appear more aerodynamic. So, you’re looking for an exhaust tip, but you aren’t quite sure where to start. No problem. This quick overview will help you better understand some of the differences among exhaust tips so that your decision becomes a LOT easier. Trust me, I was pretty confused, myself, at one point. There are many styles of exhaust tips, but most of those styles are differentiated by the actual shape or material of the tip. I’ll come back to that in a moment. For now, I want to discuss single wall and dual wall exhaust tips, since those are the most obviously different styles. Single Wall Exhaust Tip – This is the type of tip most people are familiar with. Essentially, it’s a single straight pipe that attaches to your tailpipe. A single wall tip can come in a variety of shapes (I’ll look at those below) but what is most important to remember is that it is just a single pipe with a single tip. 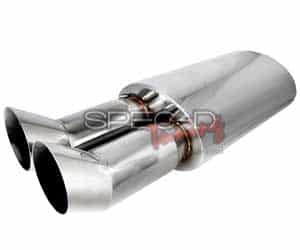 Dual Wall Exhaust Tip – The dual wall tip begins as one pipe and splits off into two so it looks like you have two exhaust systems running off your car. There really isn’t a difference in terms of sound or performance between the single wall and dual wall tips. It all comes down to looks. The dual wall tip implies that your car has more power – as if it runs on a jet engine that needs the extra exhaust output – giving it a more beefed-up appearance. Selecting the perfect shape is often the step that most people stall at. They think it over, scratch their heads, try to imagine their car with any of a variety of tips. 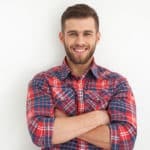 One quick way to make this decision is to look up pictures of similar vehicles with a variety of tips so you can see how the finished product will look without committing yourself to a lengthy process of trial and error. Straight Cut – This kind of tip is literally straight with a blunted end. It looks as if a pipe was vertically sliced at a perfect 90-degree angle. These tips are often the most visible. They stand out because they tend not to follow the curvature of the vehicle. Some people prefer their tips to blend into the shape of the car – those people should consider an angled cut. For those who want to show off their shiny exhaust tip, tough, a straight cut is often best. Angled – Angled tips are still straight pipes but their ends are cut at an angle (often 45 degrees). They deflect some sound and heat downward without bouncing it off the ground. They tend not to produce as loud of sound from the exhaust system but blend much nicer into the appearance of any sporty vehicle. They also give a more aerodynamic appearance for race cars. Turndown – These tips literally bend downward. Instead of being straight pieces of piping like the straight cut and angled cut tips, turndowns bend from the tailpipe toward the ground. This causes the sound coming from them to bounce back up off the ground, making the exhaust system seem louder without actually altering it very much. If you want to talk style, most people tend to enjoy a chrome-plated aluminum or polished stainless steel tip because it will sparkle in the sunlight. If, however, you’ve decided to outfit your ride with some carbon fiber and/or a matte paint finish you may want to look into a brushed stainless steel instead. Since many of us purchase an exhaust tip for its effects on the overall sound of our vehicles, let’s take a quick moment to define which types of tips are best for getting which types of sounds. 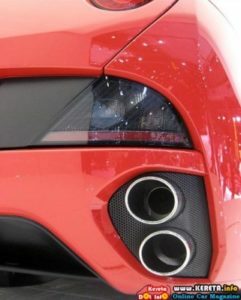 A Low Growl – Low, rumbly exhausts are usually outfitted with a short, wide tip. If this is your goal, try to find out with a large outlet. Regardless of your inlet size, a large outlet will create the growl you’re looking for. If a short pipe isn’t possible to reach the end of your bumper, consider going slightly larger in circumference than you were originally planning to make up for the length of the tip. A High Cackle – Thin, long tips tend to create higher pitches. To add a good cackle to this system, though, you may want to consider a long, thin, resonator tip. Resonator Tips – Want more reverb? Want an exhaust system that doesn’t just amplify the general sound of the car’s engine, but one that will create a cackling rumble of its own. Want to try to make your new-ish car sound like a beasty muscle car from the 1960s or a Harley Davidson? A resonator tip may be just what you are looking for. Remember, though, that resonating tips tend to increase the volume of the exhaust system, as well. So, if you want the reverb without the added noise level, consider adding a high-quality muffler to your exhaust system, too. Don’t just focus on aesthetics, though. Size is also very important. Not only will the size of the exhaust tip alter the appearance of your car, it will determine whether or not it even fits on your car. I’ll look at finding the right fit in more detail in a different section. Buying an exhaust tip isn’t as easy as just ordering the one you think will make the nicest sound or the one that looks the coolest. You will have to ensure that it will actually fit your car’s exhaust system or find yourself doing a lot of retrofitting work to get it to fit. Inlets are your primary concern. Always make sure that the inlet for the tip is made to match the diameter of your car’s tailpipe. Did I lose you already? An inlet is the area of pipe that is on the back end of the exhaust tip. It is the piece that fits into or around the tailpipe (depending on the attachment design). The company should clearly state the inlet size in the description of any exhaust tip, because they know how important this measurement is. Your tailpipe is the piece of pipe that sticks out the back end of your car. It is the stock part of your exhaust system which ensures the gasses make their way out the back of your car. This is the piece you’ll be attaching your exhaust tip to, so it is important that they are compatible. How do you know if your tailpipe is the right fit for the exhaust tip of your dreams? Measure it. The sizes given in descriptions of exhaust tips are usually diameters, so you will have to measure the diameter of your tailpipe. That means measuring straight across the opening from one side of the circle to the other. Another thing to consider is the length of your desired exhaust tip. You want to be certain that it clears the back end of your car without sticking out so far it is unsightly. There will likely be more measuring involved here. If worse comes to worse and it seems as though your desired tip is too long you can remove a portion of your tailpipe. If you aren’t familiar with this type of work consult your local garage. OK, I want to take a quick break from discussing exhaust tips (since I’ve have spent so much of this article doing just that) and take a closer look at mufflers. Despite what many people may think, they can be quite an important part of the overall exhaust system. 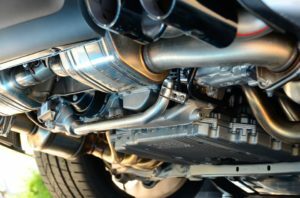 There are three main types of mufflers to consider and each will have its own impact on your vehicle’s sound and performance. 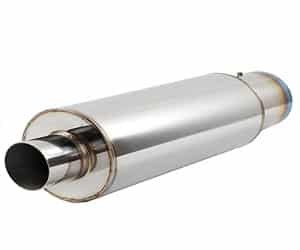 Chambered Mufflers – Though they still help muffle sound (as any good muffler should) a chambered muffler also alters the sound coming out of your car’s exhaust system. It runs the air and gasses through a special series of chambers (hence its name) to make the overall sound a little throatier. Combine this with an exhaust tip of your choice and you could have one sweet sounding ride. Turbo Mufflers – Perhaps the absolute best as deadening sound, turbo mufflers wind air through an S-shaped tube inside the muffler so that it gets quieter and quieter before finally reaching the tailpipe. If you want your ride to have a whisper-quiet sound this is the type to choose. Straight Through Mufflers – Interestingly, despite the fact that the type before this one was called “turbo” the straight-through muffler is the one that is actually bound to help your car go fastest. Because they do not catch the air as it passes through these mufflers create little resistance, allowing the air to pass through faster, thus allowing the engine to work at a faster rate – giving you more horsepower. Since they don’t actually trap the air and sound, though, and instead rely on insulation to deaden sound they actually muffle sound the least of all three options. 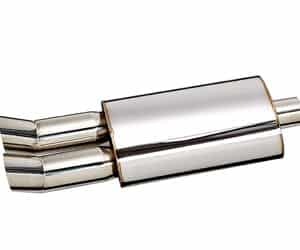 Generally speaking, you can find exhaust tips which are either chrome-plated aluminum or stainless steel. The differences among these tips are mostly related to weight, price, and durability. Chrome-Plated Aluminum Tips – The least expensive of the two popular options and the lightest weight, chrome-plated aluminum tips are not very strong, can rust if the plating flakes off and may not create as solid of a sound as the other two types (these may sound a little “tinny”). Stainless Steel Tips – Stainless steel tips aren’t as shiny as chrome-plated aluminum tips, but they can be polished to give a similar look and feel. They are more expensive and add considerable weight to the exhaust system, but are also much more durable. They can handle a bump much better without denting and are naturally rust-resistant.